The hybrid-electric new Cascadia is essentially a conventional 6×4 diesel, converted into a 6×2 diesel with an electric tag axle. 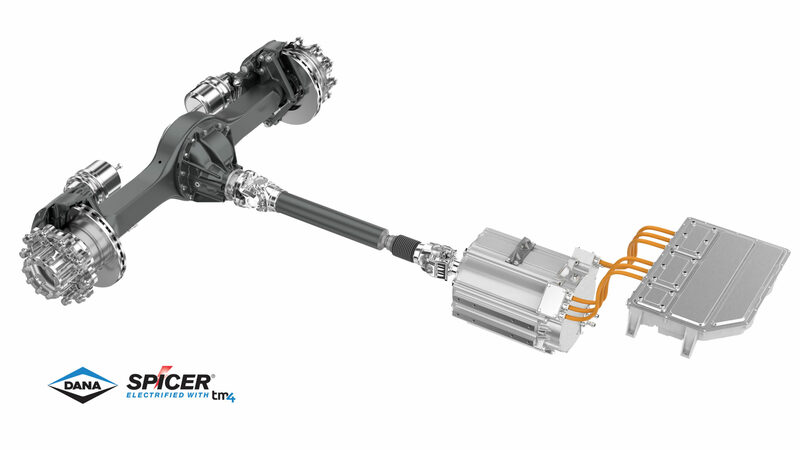 Energy is captured during braking and while descending grades, which is then stored and discharged through the e-axle – powered by Dana motors – when the truck is accelerating or climbing hills. This provides fleets with over-the-road fuel savings of as much as 12%, depending on route and terrain. The second element of the fuel savings, according to Hyliion account manager Matt Gold, comes from the electric Bergstrom auxiliary power unit (APU), which is also powered by the electric motor. It allows fuel savings of 5-10%, depending on which type of APU it’s replacing. The e-axle provides up to 115 hp and 1,500 lb.-ft. of torque. An algorithm within the control unit determines the output based on grade and terrain. From behind the wheel the truck has the feel of a normal diesel-powered vehicle, but on uphill grades the extra torque provided by the electric motor give it the ability to pull away. Gold said the target fleets for this configuration are those who operate in hilly terrain and currently idle overnight or use a diesel-fired APU. Fleets operating on flat ground are not likely to get the full fuel economy benefit. 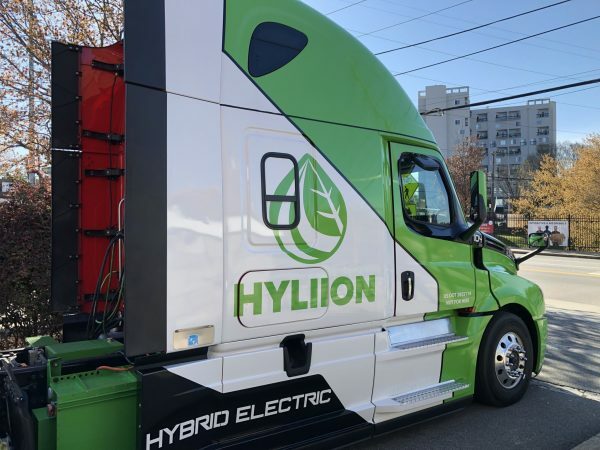 Hyliion so far has 15 trucks with its hybrid system out on the road, all of them in the U.S. But there has been interest from north of the border, especially among fleets operating in the mountains who want the additional uphill power, and those running compressed natural gas (CNG) engines, which at a 12-liter displacement, are moderately underpowered in some situations. Hyliion has yet to deploy a system into the Canadian market, but that’s mainly because it’s still a small outfit, with about 50-60 employees, out of Austin, Texas. It got its start in Pittsburgh, Pa., but moved to Austin to take advantage of the tech talent available there. It recently got a big boost of confidence – and capital – from Dana, which on March 5 announced it was taking a sizeable equity position in the company. Dana can now offer customers a complete hybrid-electric vehicle system, while Hyliion benefits from access to Dana’s technology, including electric motors and traditional components. 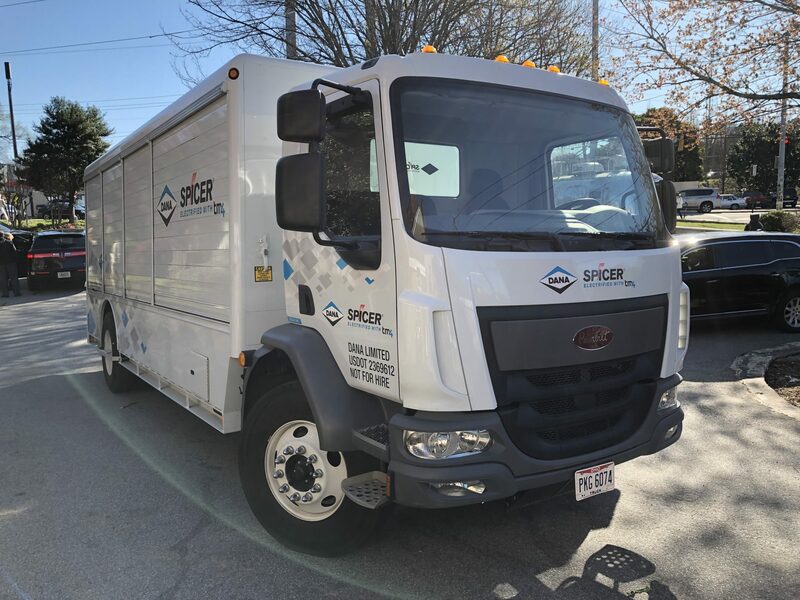 Gold said ongoing fleet evaluations have been positive, with drivers appreciating the additional torque and fleets seeing fuel savings anywhere from 5-15% on the road, and another 5-10% from the electric APU. Inside the cab, drivers can monitor the co-pilot tablet to see how they’re performing and how the system is working. A white leaf indicates when the system is inactive. It turns green when the electric axle is working, and blue when the system is capturing energy from braking or descending a grade. The driver is rated based on his or her ability to drive the vehicle in a fuel-efficient manner. “We’re trying to develop a more unbiased way for fleets to rate drivers, and the goal is to build a reward system that’s tied to it as well as develop a mobile app and develop a new way to have a driver community,” Gold explained. The key to maximizing the benefit of the electric-hybrid system is to deploy it in the right setting, Gold emphasized. “A big learning we’ve had over the last three years is the importance of being on good routes,” he said, adding most validation has been done in West Virginia and Pennsylvania. The Hyliion system is still in fleet testing, with commercial production in the not-too-distant future. Also available for a short drive on Atlanta streets was a Peterbilt Model 220 with a fully-electric powertrain supplied by Dana, and its majority-owned subsidiary TM4 out of Quebec. The truck was upfitted by Nordresa with an urban beverage hauler body. Spec’s included: a Spicer S130 single reduction medium-duty single drive axle; SPL 100 driveshaft; TM4 Sumo MD HV2600-6P electric motor; a C0200 inverter; and a 93 kWh battery. The electric motor and inverter were supplied by TM4. The powertrain boasts an incredible 2,036 lb.-ft. of torque, close to that put out by the Cummins ISX15 15-liter engine. The truck can start on a 23% grade and maintain a 20% grade at 20 mph. It boasts a top speed of 70 mph and has a range of about 100 miles between charges. Basically, the truck can do everything its diesel-powered counterpart could do. Harry Trost, senior manager, product planning with Dana, pointed out these aren’t proprietary parts. In fact, the motor and inverter are in more than 12,000 vehicles in China. “So, this is production-validated, not a prototype,” Trost said. There is also little in the way of compromise when it comes to payload. The diesel engine and transmission are removed, and the battery management system drops into its place. Trost said the vehicle weighed 14,500 lbs unladen, which offered pretty much weight parity vs a diesel. The truck was completely silent at start-up and the torque was abundant upon acceleration. I barely needed to touch the brake to stop, as the regenerative braking brought the vehicle to a standstill while feeding energy back into the batteries. I’m curious how the Hyliion truck and system would work in the mountains when it’s 30 below, and full of salt and/or chained up. Is it really a practical system in cold temperatures? Does it give similar throttle response to a diesel, so the throttle can be feathered on a slippery hill?